This past February, Ramsey County Sheriff Jack Serier appointed Inspector Booker T. Hodges to Undersheriff of Administration for the county. 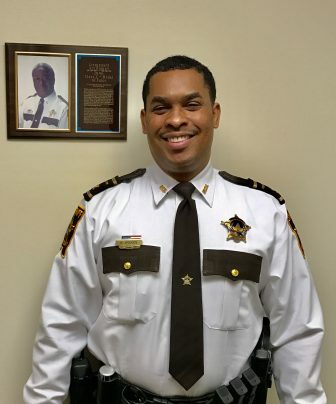 He is the just the second African American to hold the position, and the highest ranking African American law enforcement officer in Ramsey County. Undersheriff Hodges’ career began in 2005, after accepting a position to work as a police officer with the Minnesota State Fair. Through the years, he would work primarily in Dakota County and later in Ramsey County in the following positions: patrol officer, court security, school resource officer, SWAT, CIT Instructor, Undercover Narcotics, Overnight Watch Commander, and Inspector. With such a decorated résumé in such a short period of time, Hodges gives all the credit to God for getting him to where he is today. “I think ultimately, I was called to do this job. My upbringing would not indicate me being a cop,” says Hodges. He recalled the time he first became an officer and how he felt a bit tense around fellow officers in uniform, before realizing that he was one of them, as well. However, Hodges feels that the journey to becoming an officer started long before he put the uniform on. “My mom died when I was 12 of a cerebral hemorrhage. My dad and [she] used to fight a lot,” he says. “She was laying in the bed dead [while] me and my little brother was in the other room, [and] there were two Minneapolis cops in our kitchen. There is no question that urban communities and communities of color have historically struggled with racial profiling and other abusive and unfair tactics from law enforcement. One that came up during MSR’s interview with Hodges is what he referred to as the “Magic 9” consisting of: taillights being out, white taillights to the rear, third break light being out, suspended object from the rear-view mirror, riding a bike without a light on, license plate light being out, having a loud exhaust, cracked windshield, and recently expired registration. For those that don’t know, a white light to the rear is a crack in the taillight and a white light that shines to the rear. Hodges further explains that these stops happen frequently and that is why people think cops racial profile all the time. Now as undersheriff, he sits in the position to do something about it. The MSR asked the newly appointed undersheriff what were some of the things he had on his agenda. “For me it’s all about hiring people for character and training for competence. [Also] getting more people of color into the profession and eventually running these agencies, because I do firmly believe in diversity and having a diverse work force.” Hodges explains that this not only makes for a great workforce, but also has a direct positive impact on the communities served. As for training for competence, Undersheriff Hodges explains that the county has integrated over 200 hours of de-escalation training into their training. As undersheriff, Hodges sits in a place to drive the changes. He explains that only the Chief Deputy ranks above him, and then it’s the sheriff. In his role, he runs the administration division, which manages the budget, hiring, training, fleet management, and the sheriff’s internal affairs unit. According to Hodges, he is currently one of only two officers in the state with a doctorate degree; the other is the Sheriff Serier. Hodges’ education, combined with the five years he served as president of the NAACP, and his community involvement since age 16, puts him in a good position to succeed in his new role.